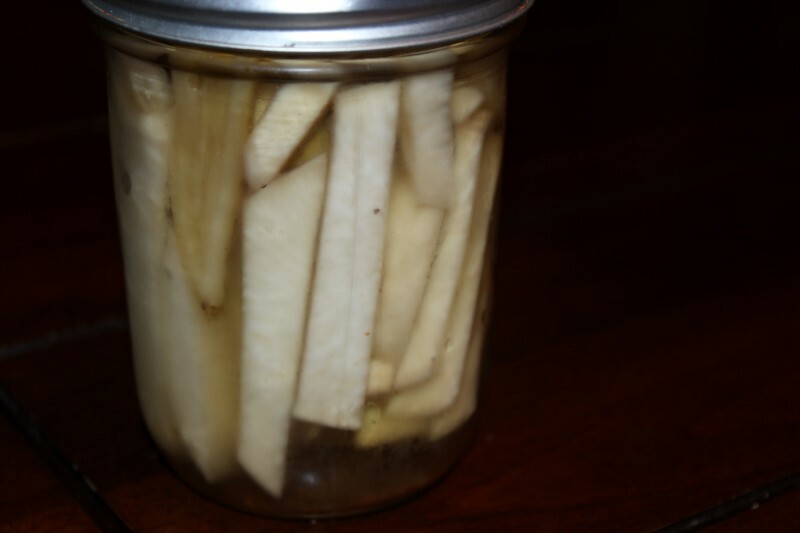 Our author cook writes: If you like a fresh radish or the taste of fresh grated mild horseradish, you will really like these pickled turnips. If you don’t care for horse radish or radishes, you will like these anyway. You can make these turnip pickles as spicy as your taste requires by adding your favorite raw peppers. This whole deal takes about 1 hour. Deep peel turnips, then cut in half and slice into 1/4" thick pieces (about 2 or 3 nibble bite size). Pack slices very tight in jars. Boil vinegar in a large boiler and dissolve sugar and keep mixture at a light boil. Fill jars with boiling water and pour water out after about 1 minute. Put 1/4 tsp salt, dill weed, celery seeds, 1/2 tsp garlic powder and 2 or 3 all spice seeds in each jar. Pour in boiling vinegar, wipe jar tops and seal tightly. Set aside and let cool, when cool shake jars up very easy. If the jars don't seal, no big deal the pickles will keep a long time on their own. Turnips ready to eat in about a week. If you plan to keep the pickles a good while and feel you need a seal, just put the jars with boiling water into a hot water bath.